Every Reason - ZineWiki - the history and culture of zines, independent media and the small press. 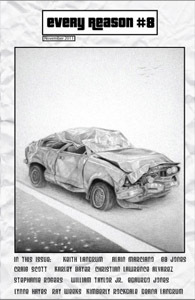 Every Reason is a zine by Keith Landrum. Every Reason is a bi-monthly literary zine published in Chattanooga, Tennessee, U.S.A. The editor states that the zine "features and promotes words that people actually want to read." Every Reason includes mainly poetry, but also fiction, essays, art work and photography. The zine was founded in 2010. By 2012, 9 issues had been released. Contributors of poetry include April Michelle Brattan, Alan Britt, Christian Collier, John Dorsey, Lawrence Gladeview, Michael D. Grover, Jason Hardung, Lynne Hayes, Gordon Hilgers, Eduardo Jones, Peycho Kanev, Keith Landrum, Lilly Penhall, Stephanie Rogers, Opalina Salas, Felino A. Soriano, and William Taylor Jr., among others. Writers of fiction and non-fiction have included Andria Alefhi (We'll Never Have Paris), Karley Bayer (The Filth Zine), and Ray Weeks. Essays have been by Keith Landrum. Photography has been contributed by Andria Alefhi, Deanna Landrum, Keith Landrum, Deirdree Prudence (Gag Me With A...), Kimberly Rockdale, and Elizabeth Soroka. Artwork has been contributed by Chris Bird, Mina Boromand, G.B. Jones, Loxley Landrum, Alain Marciano, and Mark Swanson. Keith Landrum is also one of the co-editors of Sorrow Pants, along with Tina Armstrong, Karley Bayer and Deirdree Prudence. Keith Landrum's blog, "The Greatest Lies Ever Told"
This page was last modified on 30 October 2012, at 17:37.